AfterDawn > News > Microsoft releasing a new all-digital Xbox in May? Microsoft releasing a new all-digital Xbox in May? Microsoft is planning a launch event in early May. The company is said to be launching a new version of their current Xbox One game console. Rumors have it that Microsoft is releasing a Xbox One S All-Digital Edition on May 7. This new version is a cheaper version of the already affordable Xbox One S, and, as you might decipher from the new name, doesn't include a Blu-ray or any other optical drive. Microsoft is trying to move swifter towards digital media, which makes sense especially after the news about Google's new game streaming Stadia, and Microsoft's in-house response to that. It is a perfect first step towards the digital content that will be distributed by Microsoft's upcoming xCloud platform, which is due at E3 in June. 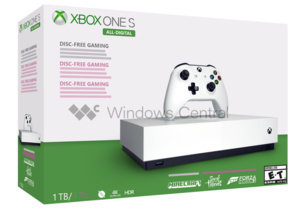 At this point there's no word on how much exactly the new Xbox One S All-Digital Edition will cost, but thanks to the folks at Windows Central we have a picture of what the retail box will likely look like. It's not an official picture of the box, but instead a remake according to their information to protect the original source. There we go, now i have to wait for 3 hours or more to download a game before i play it, and if it gets corrupt or my hard drive crashes, i have to redownload all my games, unless theres a way to backup your digital games to an external hard drive.